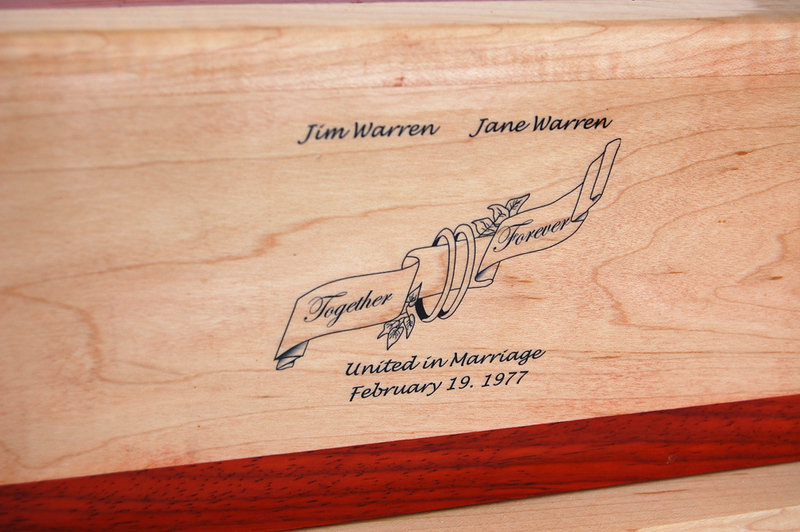 A unity (or “companion”) urn is meant for two people. The cremains of the (typically married) couple each has their own compartment. 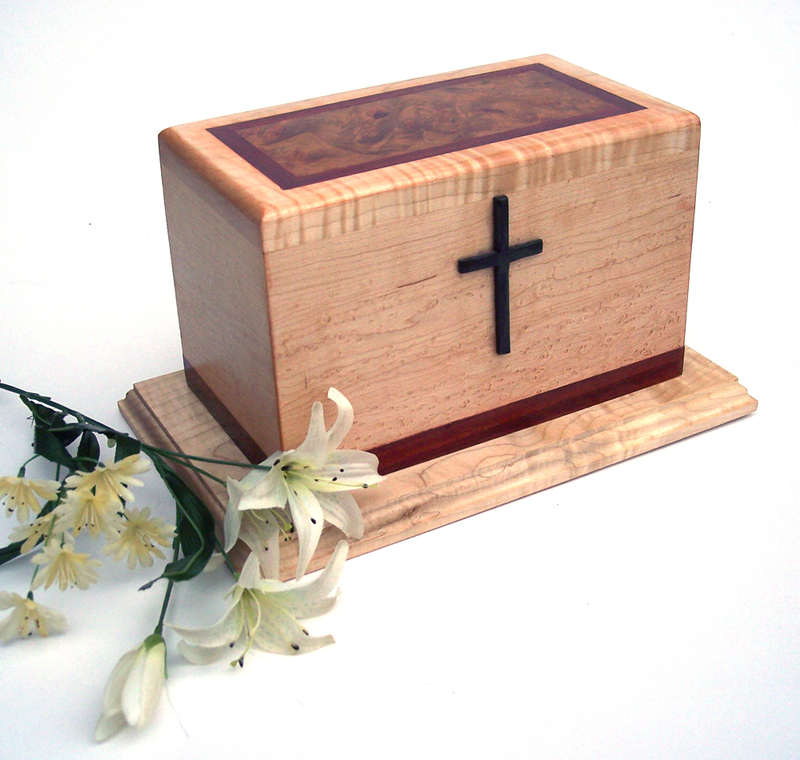 Companion urns are commonly used for couples that make the decision to be together after passing. 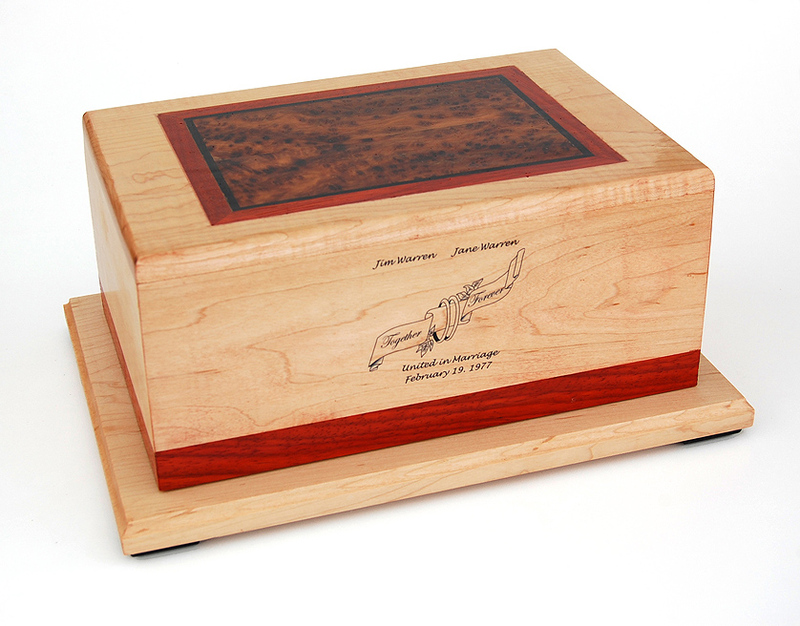 Many families will choose to purchase a companion urn before both couples have passed. This personal decision is made so when the couples pass they can remain close. The materials used in the Fairmont consist of maple, for the main body and bottom plate; quilted (or “tiger”) maple for the top, which is inlaid in either Thuya or Amboyna burl (depending upon availability; both look very similar), ebony and paduak (the reddish color wood). The approximate size of the Fairmont is 14 inches long by 11 inches wide (measuring the bottom plate) and 6 inches high. The main body, top and bottom plate of the Fairmont is crafted in 3/4″ thick maple. The “feet” on the bottom plate are ebony blocks, with softened edges – what is often called “pillowing”, because the end result is a block of wood that resembles a pillow in shape. The exact size of the internal (and thus external) dimensions of this urn is dependent upon the size of the two people whose remains will reside in each chamber; the urn in this picture specifically was for a man of 200 pounds or less and a woman 160 pounds or less. The internal dimensions are calculated by simply converting the person’s weight to cubic inches – a 200 pound man would require 200 cubic inches of space. I will over build the dimensions by about 10 percent for safety. Typically, urns are accessed through the bottom – and that is the case here, with 4 wood screws of moderate size. For no extra charge, a crest decal is provided, with the appropriate details customized. The decal is sprayed over in several coats of shellac (as is the whole urn), for protection. For an extra fee, a laser engraving can be done – please ask me for details. Materials: Maple, quilted maple, paduak, Thuya or Amboyna burl, ebony. Dimensions: Approximately 6″ high x 10″ wide x 14″ long. Finish: Clear shellac, finished with three coats of Briwax.